Watching the opening titles to episode 10 in the video clip above has really given me goosebumps. I haven't seen that clown (he never appeared in the actual story) and the music box thingy since I was a kid! In each episode a different puppet character would be inside the box, and in this clip it's Mr. Dagenham the salesman - time to do a runner! The series was actually created in the 60s, although was repeated during the 70s. Unbelievably, there was only ever one season created with 13 episodes. The series was inspired by a village in East Sussex called Wivelsfield Green. Camberwick Green was created by puppeteer Gordan Murray who was also responsible for Trumpton and Chigley. If you hadn't already guessed, the narrator is the legendary children's TV presenter Brian Cant. There were plenty of delightfully old-fashioned characters in the series, many of which are rarely seen today. 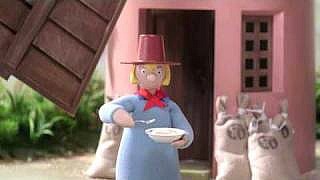 One of the most memorable characters was Windy Miller who looked after a creaky, old windmill - remember that clunking noise as the sails turned? He used to brew homemade cider and also appeared in Chigley. The very first character to pop out of the music box in the intro was Peter The Postman who delivered the post on foot. Mickey Murphy the baker sold walnut cakes for 5 shillings each. He lived with Mrs Murphy and has two kids, Mary and Paddy. Dr. Mopp drove a vintage car and had a beard. He always wore a top hat. Thomas Tripp the milkman ran the dairy (as milkman do!) and on Saturday's he Peter The Postman's son Paddy, gave him a helping hand. Mrs Honeyman liked to gossip and carried her baby around with her. She was married to the local chemist. Captain Snort ran the nearby Pippin Fort military academy and Sergeant Major Grout was second in command. Mr Dagenham the salesman drove a red sports car and would try and sell anything to everyone. In fact, in the first episode he tried to sell a helicopter to Farmer Jonathan Bell! Farmer Bell was a modern farmer who liked to use all the latest gadgets, and would often take the michael out of Windy Miller for his old-fashioned way of life. PC McGarry (number 452) was the local constable who was friendly and rode a motorbike. Mr Carraway ran the local fishmongers and used to catch fish in the river behind his shop. 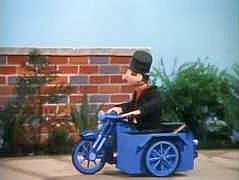 Roger Varley was the local chimney sweep, although he didn't have a van, instead relying on his motorcycle and sidecar. Finally, Mr Crockett the garage owner used to fix vehicles and serve petrol. The garage was located on the outskirts of Camberwick Green. In this episode (which is actually real and not a spoof!) Windy Miller drinks rather too much of his strong, home-brewed cider. Someone getting sozzled on children's TV - who'd ever of thought it? 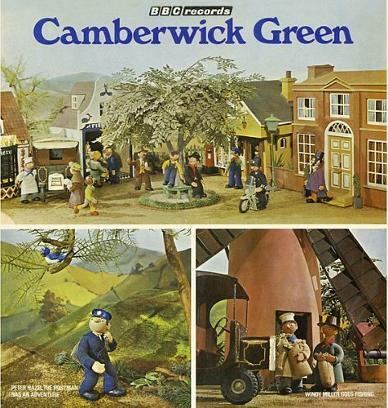 This Camberwick Green LP by BBC Records featured two stories narrated by Brian Cant and a selection of songs.